BE PREPARED: Large First Aid Kit comes with 353 premium medical supplies in a tear-resistant nylon bag. Includes a bonus 52-piece Mini First Aid Kit. HIGH QUALITY: Tear-resistant nylon bag is water and moisture resistant. Double stitching and a sturdy carrying handle ensures a long-lasting product. 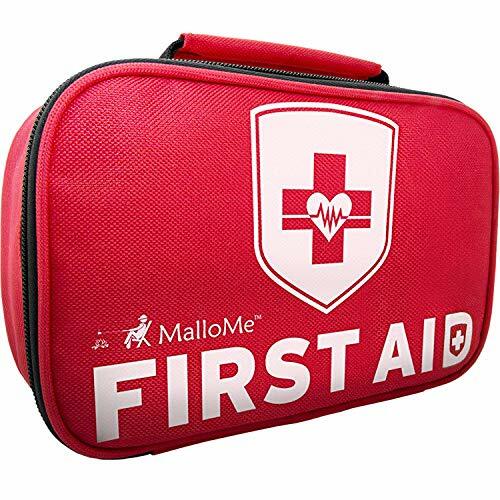 COMPACT AND CONVENIENT: Main first aid kit contains 301 items but is light and compact (approximately 6 x 9 x 2 in). BONUS MINI FIRST AID KIT: Conveniently small-sized mini first aid kit fits easily in purses, backpacks, and car glove compartments (approximately 4 x 5.5 in). MULTIPURPOSE: Perfect for use at home, school, work, in the car, and on outdoor trips like camping, hiking, and fishing.